The year was 1958. 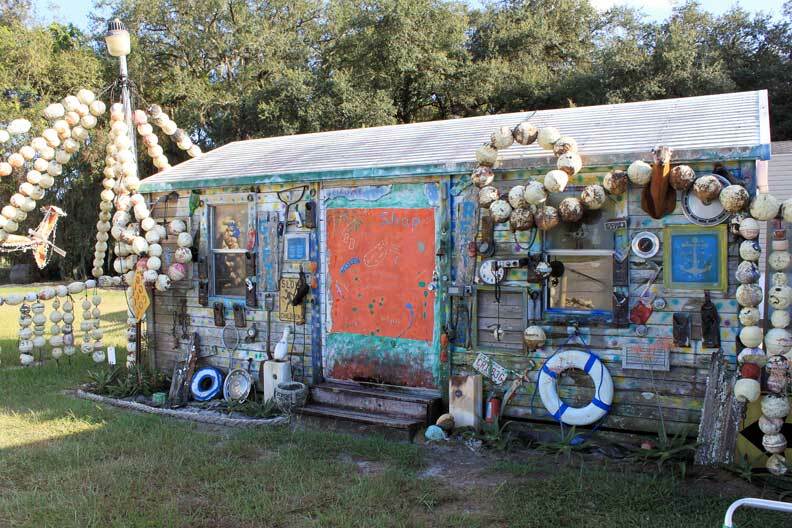 Joe Brown, 8, lived next to a county dump site in Tampa, Fla. Brown found old junk, fixed it up and sold it. 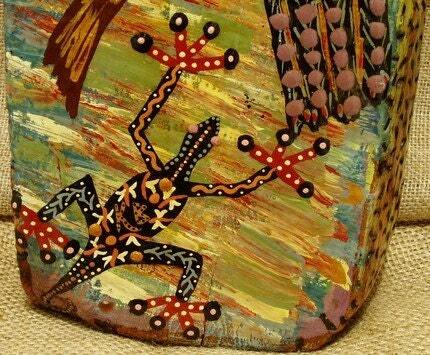 Brown knew he had a higher calling in life — he was destined to be an artist. Brown is as colorful as the gallery — he wears a bright tropical shirt with red, white and blue plaid shorts. Patrons tell him they can smell the salt water when they drive up. 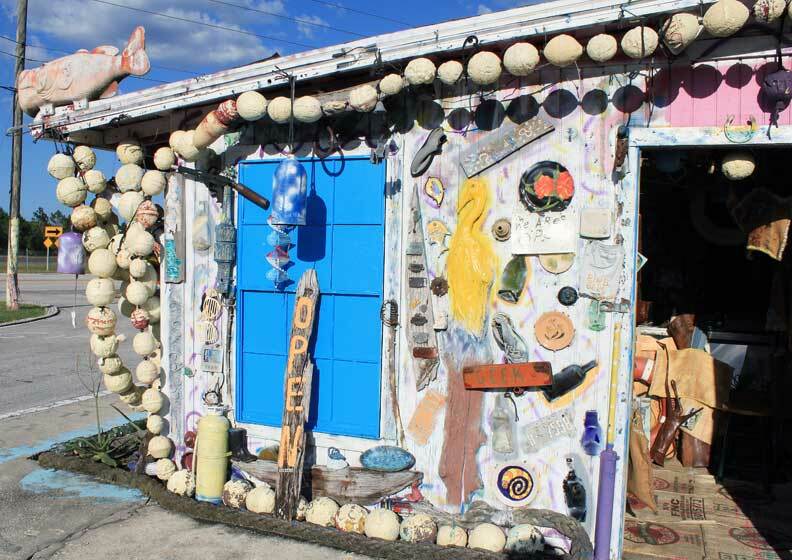 The gallery, however, is perched inland near Morris Bridge Road and Interstate 75 where a rusty-hair hen named Fred, first thought to be a rooster, patrols the property. Fred, abandoned five years ago by tourists, trots between the gallery and adjacent hotel leaving a trail of droppings behind her. Brown lived on the Gunn Highway Landfill from 1958 to 1963. 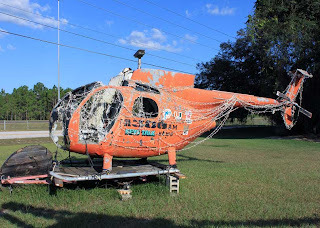 The Hillsborough County landfill operated for four years and was closed in 1962. “It was astounding how quick they could fill the 15 acres in pits that were enormous,” Brown said. An apartment complex now sits on top of the old landfill. A report by the Florida Department of Environmental Protection indicated that a lining was placed underneath the complex when it was built to block methane gas from leaking. The gas is a byproduct of rotting garbage. As a child, Brown lived on his father’s dairy and beef farm. Brown said during heavy rain, the low land on the farm flooded the neighboring Gunn Highway. In 1957, Hillsborough County officials offered to elevate the low land to stop the flooding by turning it into a landfill. When the property was sold in 1984 by Brown’s father, soil testing revealed heaps of old paper and punctured cans of spray paint. As a child, Brown foraged at nearby dumpsters. County workers saved junk for him that people dropped off. One day, Brown’s parents got a call from his elementary school teacher and told them that Brown had $100 in his pocket and that he must be stealing. Brown picked up the saved junk after school and turned it into something new. Contrary to his elementary school teacher’s accusation, he wasn’t a thief after all. Instead he was a young entrepreneur who sold other people’s trash. Brown’s mother became concerned. He said his mother knew “the value of happiness and the travels of life” and sent him to a summer art class. The art teacher inspired awe in Brown. She taught him how to reuse baby food jars by melting the glass and adding marbles to the mix to create paper weights. The teacher had traveled to Hong Kong, China and Hiroshima, Japan after World War II. She saw how people were forced to recycle and reuse items out of necessity after the war. This left an impression on Brown. It was at this time that he personified the name Hong Kong Willie, which harkens back to China where the mass production of merchandise occurs. The “Willies” are people like Brown and other environmentalists who try to reuse trash instead of throwing it into landfills. After high school, Brown went to college to study business but dropped out after three years. He worked in the material handling industry until 1981. Although Brown had achieved a successful career and lifestyle, he had become discouraged in 1979. He had been diagnosed with depression in 1973, a condition that was caused from high fructose intake and that lasted for more than four years. In 1985, Brown and his artist wife, Kim, bought the half-acre property off Fletcher Avenue and Morris Bridge Road. 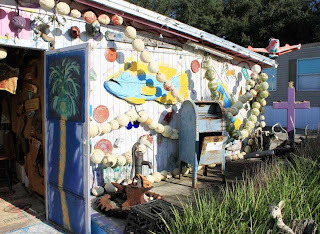 For two decades the two small wooden shacks, built around 1965, that now house the gallery operated as a bait and tackle shop. Nowadays, Brown raises and sells worms by the pound mainly for composting. He recycled 250 thousand pounds in the worm bed in 2009. Brown still sells the worms for $3.50 a cup for fishing. 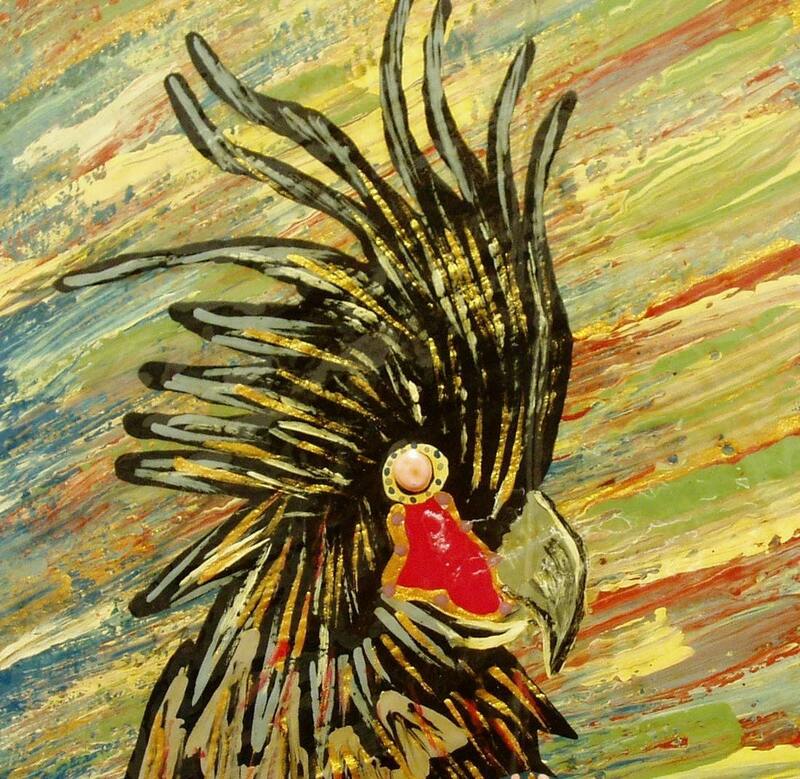 In 1981, Brown resurrected the Hong Kong Willie name from his childhood art class. 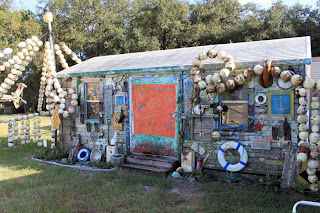 In the early 1980s, both he and his wife, Kim, began upcycling trash into art. Brown entered another world when he left his mainstream lifestyle behind — he joined the art scene and booked rock bands at the same time. 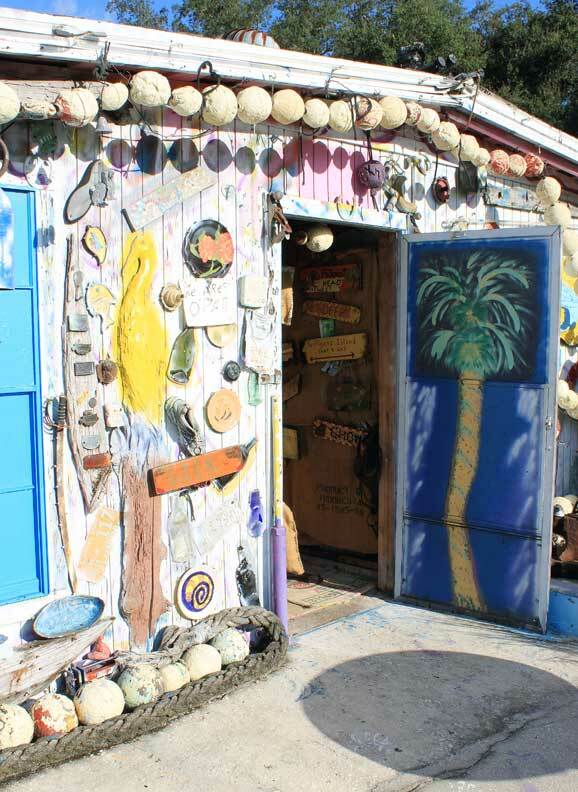 The Brown family spent half their time in Tampa and the other half in a small home on Boot Key Harbor in Marathon. 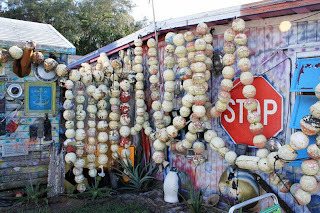 Brown gained the reputation of the Key West lobster buoy artist. Back in Key West, Brown became friends with local fishermen. He and others organized efforts to clean up plastic foam buoys that had collected in the waterways from years of fishing. The Earth Resource Foundation reports that plastic foam is dumped into the environment. It breaks up into pieces and chokes animals by clogging their digestive system. Brown sells the buoys from the Hong Kong Willie Art Gallery for $2.00 a piece. He said he has sold from 30 to 40 thousand buoys in the last ten years. 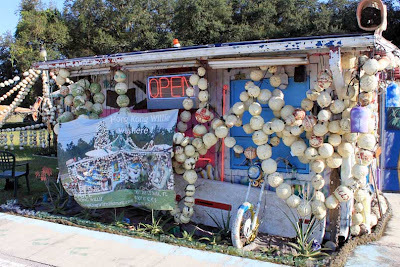 Some of the buoys are more than 50 years old and are collected by tourists from China and Japan. 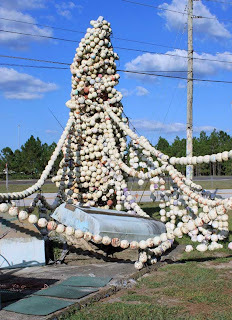 Brown made a holiday buoy tree 12 years ago from the Key West buoys. Hundreds of buoys are strung on rope and wrapped around a utility pole next to the gallery. 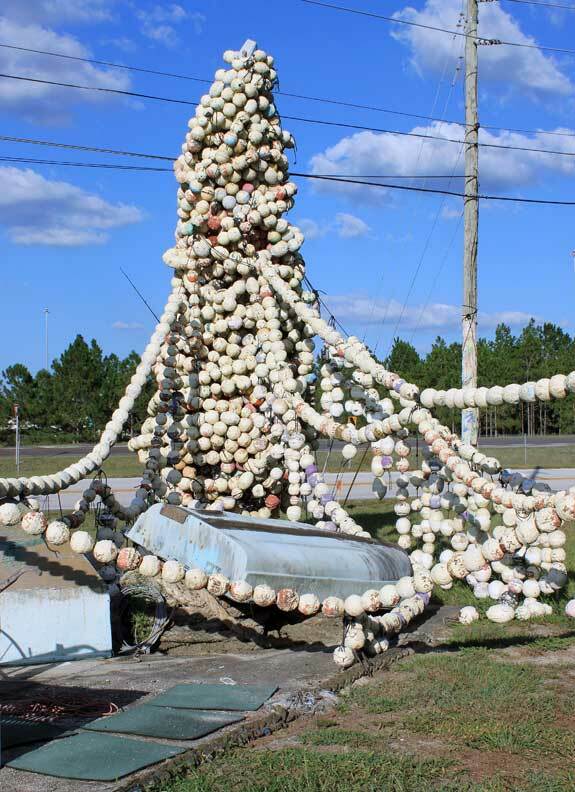 Brown hopes the novelty of the buoy tree will inspire and stimulate children to find new ways to reduce, reuse and recycle garbage. In Kate Shoup’s “Rubbish! 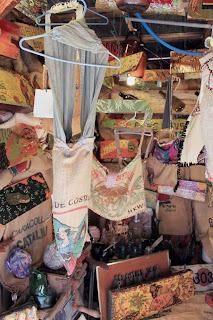 Reuse Your Refuse,” the author said much of what we get is designed to be scrapped after only a few uses. We easily throw away pens, lighters, razors and dozens of other items. Shoup said Americans consume 2 million plastic drink bottles every 5 minutes. Likewise, Brown finds uses for items that would otherwise end up in a landfill. 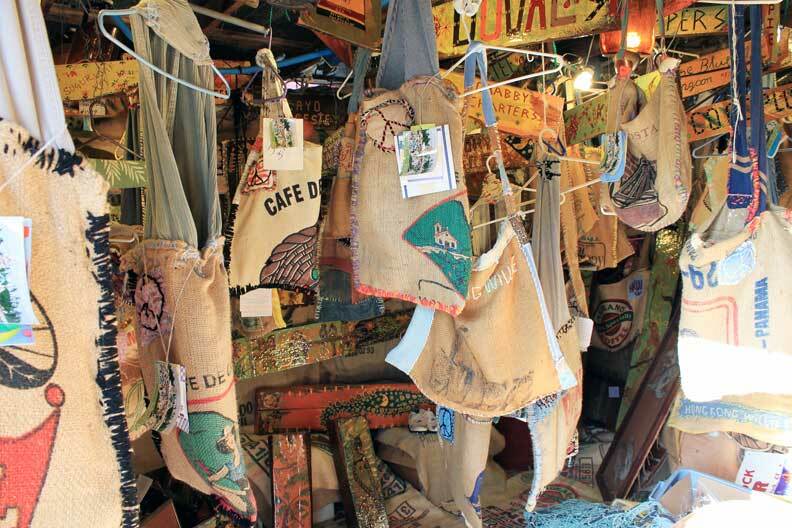 He buys used burlap bags from coffee and peanut producers. He sells them to the U.S. National Forestry Service for the collection of pine seeds and Samuel Adams for hops production. 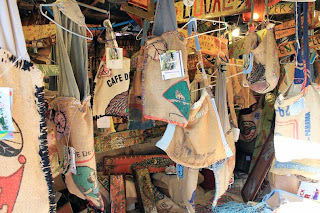 Brown and his wife, Kim, also make art hippie bags from the burlap sacks and sell them in the gallery. 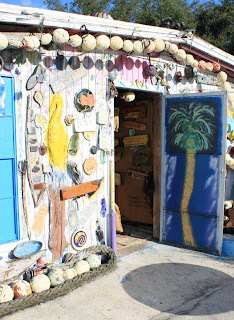 Kim, also an artist, paints fish, turtles, crows, parrots and the like on driftwood and on wood that Brown has salvaged from saw mills and from old buildings in Key West. Brown said art is viewed and appreciated by certain people. “If it all came out the same, it would be like bland grits all the time,” Brown said. He likes to refer to the gallery art as reused rather than recycled, which takes waste and turns it into an inferior product. Reuse on the other hand involves remaking an item and using it again for the same intended purpose. “I also try to stay away from imprinting a definite use for a definite item,” Brown said. He explains that 2-liter bottles are not limited to making bird feeders. The bottles can be used for art and craft projects as well. I’m working on a feature story about Hong Kong Willie aka Joe Brown and family who are reuse artists. I recently spent some time interviewing Joe Brown at his studio in Tampa, Fla. We had a pleasant talk about his working gallery. We sat outside and there was a nice breeze, although it was a warm sunny day still here in Florida. Join me in the midst of writing the story. I took a few pictures to share with you. Enjoy. 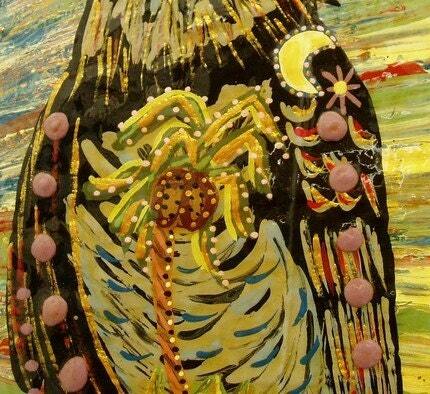 The allurement of the winds blowing in the palm trees and the moon shining through and the “Black Bird of Key Largo” looking upon. **HONG KONG WILLIE artist Kim Brown, chose aged Florida sawmill stock as canvas. Recovered Brass Hanger: Key West lobster trap rigging. Originally connects and suspends rigging of spiny lobster traps in Key West waters. Candy-like appearance due to multiple protective layers. Assigned number in artist register by Fisherman ID tag, corresponding burn-etched # rear of piece. Key recovered by Robert Jordan, acclaimed treasure hunter: also in identification of piece and artist. This entry was posted in ART, dumpsite, Environment, famous+ recycle+ART+artist, gallery, hong+ kong +willie, HONGKONGWILLIE, joe brown, Kerry Schofield, reuse, reuse artist, World+Famous+reuse+green+artist. Bookmark the permalink.